As its name suggests, the British Shorthair cat is as traditionally English as tea and scones. Here are nine facts about the stocky feline, whose chubby face, easy-going demeanor, and short, plush fur made it America's fifth most popular pedigreed cat in 2014. 1. THEY'RE DESCENDED FROM THE CATS OF ANCIENT ROME. The British Shorthair bears the proud distinction of being one of the world’s oldest cat breeds. Experts think that the feline is descended from cats imported to Rome from ancient Egypt. When the Romans invaded Great Britain in 43 CE, they took the cats with them. 2. "THE FATHER OF CAT FANCY" LOVED BRITISH SHORTHAIRS. British Shorthairs existed as street cats and barn mousers until Harrison Weir—a 19th-century animal lover known as “the father of cat fancy”—began breeding exemplary examples of the country’s native cats. He showcased the breed at London's Crystal Palace in 1871, in an event that’s considered by many to be the world’s first cat show. The show was filled with exotic imported cats, including Persians and Siamese-like cats. However, Weir preferred his country's native breed. "My first love will always be for the shorthaired domestic cat," Weir wrote in his book about various cat breeds, Our Cats and All About Them (1889). 3. THE BRITISH SHORTHAIR NEARLY WENT EXTINCT. By the early 20th century, longhaired breeds had eclipsed the British Shorthair in popularity. Adding injury to insult, cat fanciers stopped breeding the British Shorthair during World Wars I and II, and it nearly went extinct. To ensure the breed’s survival, British Shorthair aficionados crossbred their cats with Persians and other felines. The British Shorthair stuck around, and in 1980, the Cat Fanciers’ Association (CFA) recognized the feline as an official breed in America. 4. THE BRITISH SHORTHAIR MAY HAVE INSPIRED LEWIS CARROLL'S CHESHIRE CAT. Historians think that Lewis Carroll may have based his Cheshire Cat illustrations in Alice's Adventures in Wonderland off a tabby British Shorthair. 5. A BRITISH SHORTHAIR HELPED SPAWN THE "I CAN HAS CHEEZBURGER?" EMPIRE. A British Shorthair was featured in the original “I Can Has Cheezburger?” meme. The viral internet phenomenon can be traced back to 2007, when a Hawaiian blogger named Eric Nakagawa saw a picture of a happy-looking British Shorthair on an online message board. It was captioned with the now-famous “I Can Has Cheezburger?” line, inspiring Nakagawa to register a website with the same name and share the image. Nakagawa began posting more cat pictures, and he eventually turned his blog into a monetized website. It was acquired for $2 million in 2007, and became the basis for the Cheezburger Network, a network of social humor websites. 6. NOT ALL BRITISH SHORTHAIRS ARE GREY. Speaking of "I Can Has Cheezburger?”, some people think that all British Shorthairs are silvery grey with copper eyes, like the cat in the meme. That particular type of cat is called the British Blue. 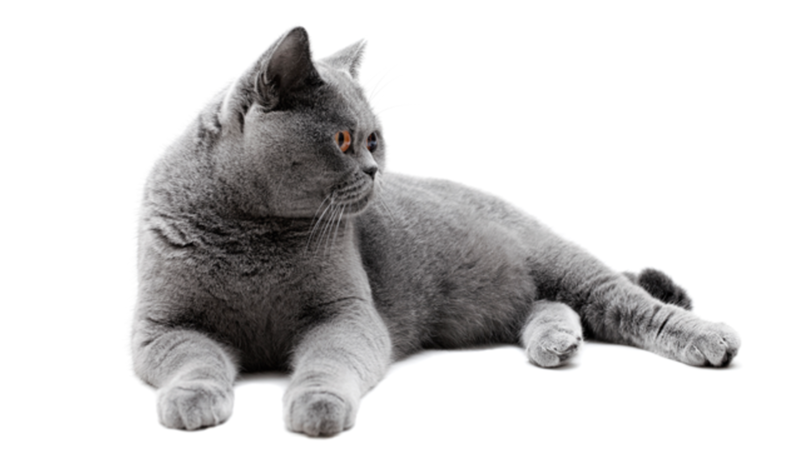 While the British Blue is a popular variation of the breed, it's not the only one. British Shorthair cats come in white, black, red, gold, and silver, among other fur colors. You’ll also spot British Shorthairs with color-point, tortoiseshell, bicolor, and tabby patterns. As for their eye colors, they range from gold to copper to blue-green. 7. THEY CAN GET CHUNKY. Mature British Shorthairs tend to weigh 9 to 17 pounds, and mature females average 7 to 12 pounds. However, the solid-framed breed has a tendency toward obesity, and can easily tip the scales at a higher weight: PetMD recently listed the British Shorthair as one of its “top 10 fat cats.” British Shorthair owners are advised to provide their kitties with healthy food and plenty of exercise, since overweight kitties face an increased risk for diabetes, heart disease, arthritis, and other conditions. 8. BRITISH SHORTHAIRS ARE MAGNETS FOR WEIRD NEWS. British Shorthair cats have appeared in several bizarre international news stories. In late 2014, state debt collectors in the Siberian city of Novosibirsk, Russia, tried to force a man to pay 12,000 rubles in unpaid taxes. Since the debtor didn’t own any valuable material possessions, the collectors threatened to confiscate his British Shorthair cat and its three kittens. "Because the animals are pedigree and expensive, the representative of the law decided to place the cat brood under arrest," the region's court marshal's service said in a statement. Needless to say, the man ended up paying his taxes, and he got to keep his cats. Also in Russia, an easily trained British Shorthair cat named Dusya skyrocketed to fame—and fortune—by starring in photo shoots, TV productions, and a commercial for a Russian telephone operator. As of March 2015, Dusya had earned around £2,000—more than what most Russians make in a year, according to AOL Money. In 2015, an Eastern European gang catnapped Maggie, a 1-year-old British Shorthair that lived with her wealthy owners in a London mansion. The thieves demanded a ransom of £5000. Maggie’s owners agreed to shell out the cash, and they participated in an exchange in a public park to get their beloved cat back. 9. A BRITISH SHORTHAIR ONCE HAD THE WORLD'S LOUDEST PURR. In 2011, a 12-year-old British Shorthair cat named Smokey was declared to have the world’s loudest purr. His vocal rumblings measured 67.7 decibels, and were reportedly as noisy as a lawn mower. Sadly, Smokey died from kidney failure in 2014. He was immortalized in the Guinness World Records until another cat, Merlin, broke his ear-splitting record in 2015 with a 67.8 decibel purr.